As I have pointed out ad nauseam here at EPJ, President Trump's tax cut is a scam. If government spending isn't cut along with the tax cut, the money will be taken out of the economy by the government in some other fashion. Today, we had a chance to observe how the money grab is going to occur. 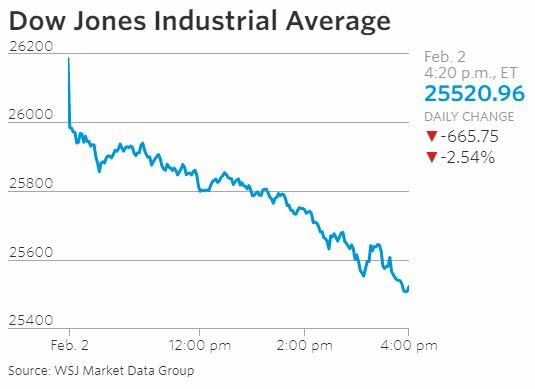 The Dow Jones Industrial Average closed down 2.25% or 665.75 points. This follows a decline of 363 points on Tuesday. Here is what is going down. Interest rates are climbing. They are driven by the fact that the U.S. Treasury is going to borrow a lot more money because government spending wasn't cut along with the tax cuts. In order to borrow more money, the Treasury must offer a higher interest rate then the current market to divert resources from other bond issuers and stock market investors. And voila the benchmark 10-year Treasury yield hit its highest level in four years today as traders prepare for the Treasury bond onslaught. When the funds are diverted to the bond market from the equities market stocks fall. Today is a teaser as to what lies ahead under bizarre Trump economics. I hasten to add, the evil role played by the Fed in all this with their money printing and suddenly slowed money pumping. This always makes a mess of things. So we have a manipulative Fed, where Trump just named a clueless lawyer to takeover, coupled with a never-ending borrowing Treasury. This is not going to end well at all. I will have deeper coverage in Monday's EPJ Daily Alert. In the meantime, enjoy your $30. Geez, last week Trump was making people money in the market vs. tax reform, this week he's losing people money vs. tax reform? $30? Where did you get that number? This is "analysis"? Here's some free "analysis" for ya: the Fed giveth and the Fed taketh away... especially when you allow public disclosure of Deep State crime. "Markets" will punish the people until morale (about Deep State crimes) improves. Look at your pay stub. Subtract 2% from the federal with holding tax you will likely see 15 to 30 dollars difference per pay period. Unless you don't get paid every other week. @ Phathead: $30 x approx. 25 pay periods is $750. So saying "enjoy your $30" is disingenuous. FWIW, I'm self employed and debt free. After talking with my accountant recently, the benefits of the Trump tax reform for me and my small biz next year, including the repeal of the Obamacare tax for not buying crony-care insurance will greatly exceed $750. Anyone who thinks they are in the "markets" buying the discounted future earnings of companies in order to fund their retirement or some such nonsense is delusional. They are in a casino where the house is rigging the games. I mean, the market went down by 666 points today, the day Trump defied the Deep State and supported Congress releasing a memo detailing its misdeeds! Down 666 points, the headline on Drudge! No numerology symbolism there, no siree. Over time, like any casino, a few people will get lucky and "win" (they must, to give the illusion some appearance of legitimacy) but the majority who are locked in by arcane tax laws and normalcy bias will lose their shirt and then some. I have some sympathy for the folks who don't know any better. I have a lot less sympathy for libertarians who profess to know better and vocally reject the crooked nature of financial markets and yet continue to "dance" while the "music plays." Pretty sure it was implied 30 per pay period, yes I hope we can all do the simple math to figure out the total per year. Of course the tax plan will affect many groups differently. Congratulations on owning your own business. If anyone wants to make money in the stock market then they should sign up for Wenzel's epj daily alert. I pull all my stocks (401k) out of the market on Monday after reading Monday's Alert. Now I am sitting on cash and missed the big swings down. I will slowly accumulate positions in the Alerts Model port folio. My other investments have been following Roberts advice and have made good gains this year, but are in even better position to gain large when inflation starts popping. @Phathead: TIming the markets, eh? Glad to hear you're winning. Watch those transaction costs. Keep dancin' while that music plays and don't forget to buy the dip. The USG will spend all it can tax and all it can borrow each year from now until there is a dollar crises. Its going to happen no matter what, the collapse is already backed into the cake. The only question is: should connected people, NGO's crony capitalists, Wall St get to feed at the trough while it exists or should ordinary honest hard working people get to keep more of their earned money. With more money I can buy gold, take care of needed medical procedures, give my children debt free education and home, buy foreign securities, get a new truck that will last ten years, put in a generator, etc. This is a Trump criticism that is on track. I remember back in Obama's first term there were rumblings about the Feds wanting to seize (or at minimum tax them up to high heaven) 401ks/IRAs and other retirement accounts. Got to wonder if that isn't bouncing on the backburner when USG debt balloons even more because of entitlements, warmongering and other assorted government boondoggles. So what you're saying is that over a decade of financial repression of savers will end and they will start making interest income again. I'll believe it when I see it, but that's hardly gloomy for a lot of people. Savers would make considerably more than a measly additional $30. Of course it's a scam. We need massive spending cuts and downsizing of government. But it's pretty clear by now that neither party will do that short of a complete collapse.